We’d love your help. 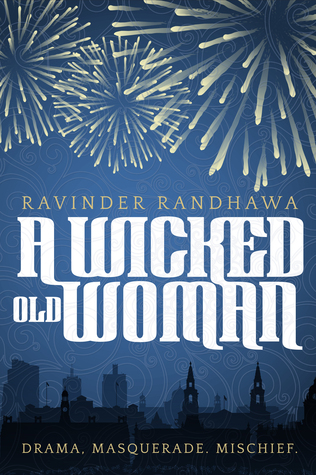 Let us know what’s wrong with this preview of A Wicked Old Woman by Ravinder Randhawa. In a bustling British city, Kulwant mischievously masquerades as a much older woman, using her walking stick like a Greek chorus, ‘…stick-leg-shuffle-leg-shuffle…’ encountering new adventures and getting bruised by the jagged edges of her life. Ther Drama. Masquerade. Mischief. To ask other readers questions about A Wicked Old Woman, please sign up. To be honest I found this book confusing. The story jumped about a bit too much and apart from Kuli and Caroline the relationships between the other characters could have had a bit more of an explanation as to how they were linked to each other at the start of the story. I loved the concepts of the books and much of it was both really interesting and well written. However as others have commented this was a tad too literary for me - I desperately needed a bit more sign posting for both the time frame and whose voice we were hearing! Three and a half stars from me! After reading the synopsis of this novel, I was immediately intrigued and when invited to take part in a blog tour for the author, Ravinder Randhawa, I knew it was a story I had to read. Fiction about India has always been a bit of a passion of mine, whether set in India or in another country, usually England in my experiences. It encompasses a wide range of characters, all of whom have very different outlooks on what it has meant to be someone of Indian culture li Three and a half stars from me! Generally, we tend to see life and the lives of others through the eyes of Kulwant who in the present time, is often accompanied by her stick and somewhat of a prickly, closed disposition. Of course there are reasons why she is so guarded, as the story continues and she reflects on her past we learn about the break-down of her marriage, her strained relationship with some of her children and a friendship that has lasted throughout the years, with Caroline, a white British woman who has been Kuli's staunchest supporter. Their relationship was probably my favourite in the novel, I loved that Caroline took Kuli under her wing so that she did not feel as much of an outsider at school and is a driving force in the present to make sure Kuli is happy and makes the most of her life. The supporting characters of this cast also play fantastic roles in this novel. We have poetic "Michael the Archangel" who asked for Kuli's hand in marriage (and was gently let down) to "Myopic Maya," who has had her own share of heart break but really comes into her own by the end of the story and finally, Rani/Rosalind whose sad state of affairs really tugged at my emotions. I have to admit that at points I did feel a little confused about what was going on exactly and I think that's probably because I picked up and put down the book quite a few times. This book would probably benefit by being read in one or two sittings and it's length (235 pages in my edition) means that this is a possibility. Once I had read a few pages however and was used to the style of writing, I really enjoyed the flow and meaning behind the novel. "...progress won't come by changing a brick here and there, the whole structure was suspect and should be challenged as a whole." As a means of furthering my own education about Indian culture, this book definitely did the job and as a novel generally, it's a fantastic piece of work that I think most people will be able to identify with even if there are differences in race. I learned a lot and will be thinking about some of these characters for a while as a result of this story. I know about you, but when I read the blurb of this book I had many images of scandal, woman-power and cultures I know very little about. The book is the entwined stories of several Indian women living in London, focusing on the everyday struggles they face within the community, family and their Indian culture. Personally, it really opened me up to how people who weren’t originally born in England, struggled to adapt themselves around a new way of living, in addition to juggling their family and I know about you, but when I read the blurb of this book I had many images of scandal, woman-power and cultures I know very little about. The book is the entwined stories of several Indian women living in London, focusing on the everyday struggles they face within the community, family and their Indian culture. Personally, it really opened me up to how people who weren’t originally born in England, struggled to adapt themselves around a new way of living, in addition to juggling their family and their remaining faithful to their culture. The major thing I liked most about this book was finding out how the different characters slotted into each others lives and how each individuals story linked to another persons. For me, this is extremely exciting as I love stuff like this and it always urges me to carry on reading as I’m determined to find out. However, as the result of having so many different female characters, I got confused several times as I couldn’t keep up with whose story was who’s, and me being the forgetful and silly person I am, couldn’t remember who some of the characters were and how they linked with others. This may be a problem just for me as I have been extremely stressed and busy this week, but in some places it was very higgildy-pickildy. Despite this, I overall did enjoyed the book lots, as it was very beautifully written and I’m not just saying that, I could sense and feel the emotion put into the novel and I appreciated every single word written. You really got to connect with the characters and really sympathize with them as they faced difficult situations. The protagonist Kulwant, has got to be one of my favourite female characters. She’s just incredibly charming in an un-charming way (if you understand me?) and a brilliant character who just fills me with so much joy. They way she see things in such a vibrant way and how Randhawa expressed her unique style through a large array of aromatic food images full of spice and deliciousness. I extremely enjoyed getting to know about the Indian culture as regrettably it is something I don’t know much about, so that was very inspiring. That blurb had me thoroughly intrigued from the outset, and whilst this is an intriguing novel it is a very different beast to the one I was expecting when I started reading. The novel is a jumbled collection of characters and situations, story threads and backstory that takes a while to untangle so you can see the pattern clearly, and whilst I think this may put some people off, once you get through to that point it is well worth the effort. The writing is lyrical, in places overly verbose, an exercise in linguistic gymnastics as Ravinder plays with language, thoughts and feelings to create an almost poetical writing style that paints Kulwant’s life in vivid colours. This can become confusing and frustrating as you try to unravel the meanings and thoughts hidden in sometimes overly complex language. However in places it can be brilliant in its execution. It can also provide some confusion as the characters are predominantly female and the author has a tendency to refer to characters by pronoun rather than name. That can lead to confusion and frustration as you have to then not only untangle the writing, but also try to work out who is speaking and to whom. However despite these drawbacks and frustrations I thoroughly enjoyed working my way through this novel. It’s unique, fascinating and complex. I loved watching the characters grow, come into their own and embrace the world around them. I loved the culture, Kulwant’s experiences being Asian in England, the community and the vibrant characters that populate the novel. An intriguing story, but difficult for me to read/follow. I enjoyed the background and premise of the story, but I was confused many times while reading the book. I am not sure if it was the writing style, format or just the moving around between the characters and whether she was in disguise, reflecting on an event, or herself, but I had to re-read sections of the book many times to make sure I was following the events and people. Once I re-read and knew I was following the section though I enj An intriguing story, but difficult for me to read/follow. I enjoyed the background and premise of the story, but I was confused many times while reading the book. I am not sure if it was the writing style, format or just the moving around between the characters and whether she was in disguise, reflecting on an event, or herself, but I had to re-read sections of the book many times to make sure I was following the events and people. Once I re-read and knew I was following the section though I enjoyed the story and the world that was created for me to explore. I do not use stars on my blog, so this would actually be a 2.5-3 star if I did because again I enjoyed the story, but had some difficulties. I think if I had not had a hard time following the story this would have been a 3-4 star. Again, I do wonder if the writing style was just told in a different storytelling fashion from what I am used to reading because as I researched this book and author I found quite a few reviews and posts that likened the writing style to poetry, which I do not usually read. The story premise was intriguing and language very descriptive. I could imagine some of the scenes and thought this was an interesting take and view of and into cultural differences, norms and societal changes through the 60s, 70s and 80s. This question and my enjoyment of the story idea and descriptive language have left me wanting to read another book by Ravinder. I received a copy of the book for free to read and review. On reading the summary on the back I was very intrigued and looking forward to reading it as it sounded very interesting. Unfortunately I found it quite hard to follow the story as it moves between the past and present and jumps around different characters so sometimes I got confused about where the action was taking place and who the author was talking about. I also found the language used hard to get into and sometimes it put me off co I received a copy of the book for free to read and review. On reading the summary on the back I was very intrigued and looking forward to reading it as it sounded very interesting. Unfortunately I found it quite hard to follow the story as it moves between the past and present and jumps around different characters so sometimes I got confused about where the action was taking place and who the author was talking about. I also found the language used hard to get into and sometimes it put me off continuing the story. I always read on my commuting to and from work and for some reason I just could not get into this novel and it made my commuting feel longer than usual. It moves between the past and the present perfectly. It is full of lively, vibrant and interesting characters. It paints a unique and intriguing image of what it is like being Asian in England. It is a thought-provoking and interesting read. As a non-Indian, it was a very eye-opening and intriguing novel to read, a perfect insight into how different cultures can be. The pace worked really well throughout the novel, just keeping you curious enough to keep turning the page and seeing what would happen next. It was written in a very fascinating and unique way, especially as it jumped through the different time periods. I received a copy of this book for free through Goodreads FirstReads competition. When I read the description of the novel I immediately thought it was my kind of book 'Drama. Masquerade, Mischief' sounds like it has all the elements I love in a novel. Kuli and her stick-leg-shuffle-leg-shuffle are accompanied by an unforgettable cast of poets, writers, readers and people with mental health difficulties. This book explores themes from racism to romance and adds in some writing- all in flashbacks. A book I will remember for a long time to come. Highly recommended to those looking for a fun read with a serious side. I received this book free from Goodreads giveaways and, from the synopsis on the back of the book, was really looking forward to reading it. Unfortunately, although I did manage to plough my way through it, I found it extremely confusing and struggled to remember who all the different characters were and how they were related. I liked the premise of this, but found it hard to get into. I abandoned and returned to it several times but found it too confusing. There may be a good story in there, but I'm afraid I could not persevere long enough to find it. Review of an online copy from the publisher. A funny, honest, quick and important read. But it's also quite confusing at times, which it makes it hard to figure out who was related to who, and which voice was narrating at the time. Other than that, I really enjoyed this. I normally enjoy books and stories by Indian authors, but this one wow, I found it hard to get into. I left it and returned to it often but found it confusing. Ravinder was born in India, grew up in England, and lives in London. Loves books, great coffee and is a Shakespeare groupie.